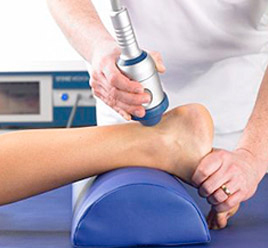 Shockwave can help treat many conditions, includng plantar fasciitis, heel and arch pain, achilles tendon pain, calcific tendinosis/tendonitis, shin pain/tibial stress syndrome, patellar tendonitis, chronic neck, shoulder and back pain, muscle tension (trigger points), tennis elbow, and wound healing. Extracorporeal shock wave therapy is effective in treating chronic plantar fasciitis: a meta-analysis of RCTs. Randomized, placebo-controlled, double-blind clinical trial evaluating the treatment of plantar fasciitis with an extracorporeal shockwave therapy devise: A North American confirmatory study.